First of all, let me say that I accidentally read the second book first. Now I know that it's not really relevant, but I would not want you to do the same thing - all I can say is: "the prequel effect." Overall, I thought that this book was a cute, light and fun read; like a paranormal version of chick lit. But, I did think that it was a bit cliched in parts: Derek and Simon just annoyed me, I thought that the other relationships in the novel were sometimes predictable also. Maybe it's just me, but I thought that the plot was a bit slow; the major, minor even, events were too few and far in between. Don't get me wrong - if the string of events picked up pace, it would probably be a great, action/ adventure/ paranormal/ slightly romantic teen novel. So, if you don't mind looking past the slower plot pace, then you could definitely enjoy this easy read; it has it all, action, adventure, romance, drama, inmate rivalry and a little bit of the dark side. 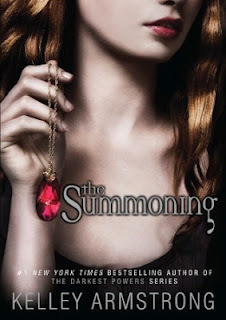 The downfall was that The Summoning's concept was great but not executed well. Necromancy, teens trapped in an asylum-type "hopsital", a little bit of romance and a bad boy. Hopefully if you know this, you can take it for what it is and enjoy those little moments.